I LOVE Apothekari! Although hesitant to try the line because I was happy with my current skin care regimen, I’m so glad that I took the plunge to purchase the Bespoke Vitamin C serum, the A is for Anti-Aging night serum and the Firming Eye Gel. I love using all the products and feel they have improved my skin’s appearance. I was also reassured about the line when I called and spoke with Joanne….she answered all my questions and was very helpful. I was also very excited when I received my order, which included a full size of the Vanilla Rose sugar scrub. I would not have ordered it on my own but can I tell you how much I LOVE, LOVE, LOVE it!?! It smells great and has completely changed the appearance of the skin all over my body, leaving it feeling soft and smooth. My husband noticed a difference too – so much that he ended up buying me the sugar scrub trio for Christmas! Now I’m also in love with the Bamboo Lemongrass Foaming Body Polish and the AHA-Mazing Cleanser. Thank you for keeping me and my skin happy, Apothekari. Apothekari has been my go-to line of skin care for about two years now. Although I try other products on the market, I keep coming back to Apothekari. 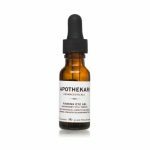 Nothing else produces results like the combination of the Bespoke Vitamin C serum in the morning and the A is for Anti-Aging retinal serum at night. My skin is brighter, smoother and more even-toned. Plus those annoying little blemishes on the forehead: gone! 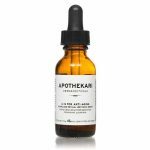 I am a huge fan of Apothekari Dermaceuticals! It feels good to be using high quality skin care products by a company that’s not only local, but also delivers on its promises. My favourites are A is for Anti-Aging Retinal Serum and Bespoke Vitamin C 15% Serum. My skin has never felt better – smooth, firm, hydrated, and radiant! I was initially reluctant to switch from a well known (and pricey!) skincare line to Apothekari. However, after hearing great reviews from friends, I gave it a try. What a great decision! From the facial products to the body scrubs and moisturizers, I now use them all. I love the gentleness of the Cloud Nine cleanser and the Daily Infusion moisturizer, and the brightening effects of the Bespoke Vitamin C serum. From head to toe my skin feels and looks great. I have enjoyed these products so much that I now give them as gifts to friends and family. 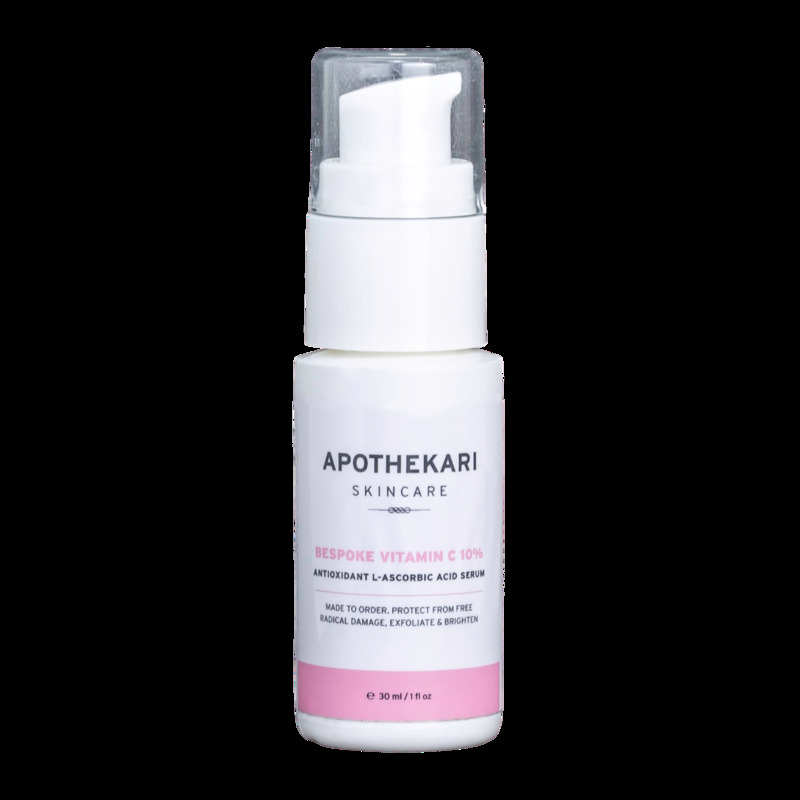 I first heard about Apothekari from a friend and decided to give it a go as I was looking for products specifically for aging skin. I was dealing with fine lines around the eyes and some age spots and sun damage. Plus I felt like I needed some extra moisturizing, especially in the winter. Since I started using A is for Anti-Aging and the Vitamin C Serum, I’ve noticed some amazing changes in my skin. Dare I say my skin glows? I’ve had absolutely no issues with the formulations (no irritation), have noticed a fading of sunspots, and no acne flare ups whatsoever along the jaw line which I used to get periodically. I love the Vitamin C Serum so much I’ve actually bought more of it to give to friends. 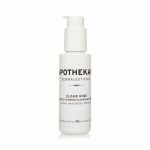 Apothekari calmed the redness I suffer due to Rosacea and the the face products left my skin glowing. I love the body scrubs, especially the aroma in the vanilla rose, and enjoy the subtle aroma left after a scrub. It’s great to know that they are chemical free and a local Vancouver brand. I have used these products for more than six months and the results are amazing, my skin is hydrated, smooth, fresh-looking and glows. 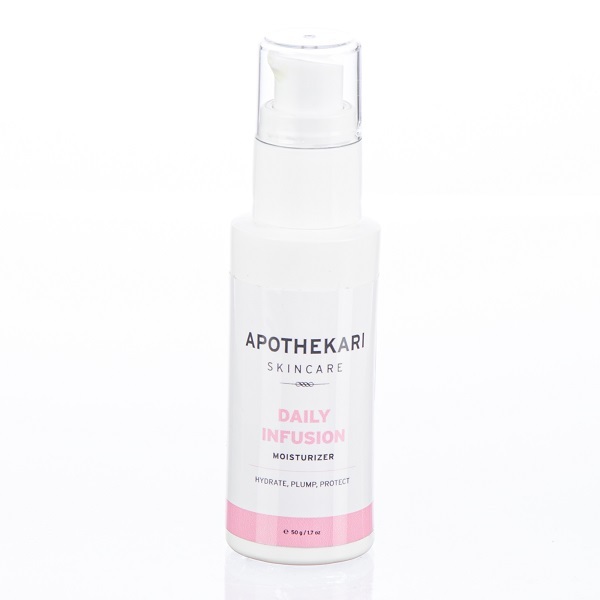 I used the Daily Infusion Moisturizer twice a day and it is light, absorbs well not oily and fragrance free. In the morning I use the Bespoke Vitamin C and in the evening I use the A is for Anti-aging Retinol Serum, my skin is more plump, less wrinkles and feels fresh. I also love the Lemongrass and Bamboo body scrub, it glides on smooth with just enough exfoliation that leaves your skin radiant. I have had so many compliments about my skin and even my husband is using the products. The prices are very reasonable as I have used other more expensive products but most of all I am sold on this line because of the wonderful results! Try it you’ll love it! I have used many expensive facial products but nothing compares to Apothekari. It’s a clean, fresh, simple line with active ingredients and no parabens! I am in my 50’s and the products work like dream for me. 1) The Daily Infusion Moisturizer: light, absorbs well but emollient enough to keep my skin looking hydrated but not oily all day. 2) Bespoke Vitamin C 10% and the A is for Anti-Aging: using these every other day (not daily) and am still getting amazing results- smooth, bright, hydrated and “wrinkle free” skin. 3) Firming Eye Gel- goes on and absorbs quickly, helping refresh tired eyes and diminish any fine lines. This line is a GEM in the complicated world of anti aging beauty products. Its effective, priced so well and the best part is I am getting so many compliments from friends! I’m a BIG fan. I have been using the Bespoke Vitamin C 15% in the morning and the A is for Anti-Aging Serum at night for a few months. The combination makes my skin look brighter and feel smoother. I’m happy also, that the Vitamin C serum delivers antioxidant protection during the day.